More than 40 high school and community college business teachers from around the state recently attended a conference at Stephen F. Austin State University for the annual Texas Business and Technology Teachers Association. SFA's Department of Business Communication and Legal Studies, housed within the Rusche College of Business, hosted the conference. This year's conference focus was "On the Beam: Finding a Balance Between Humanity and Technology" and included various speakers who discussed topics such as online and face-to-face courses and online educator technology. 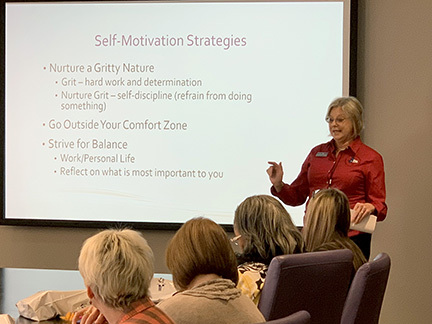 Dorothy Hetmer-Hinds, pictured, from Trinity Valley Community College discussed motivation and how to become effective educators in today's digital age. SFA business students enrolled in a leadership communication course assisted with the conference arrangements and delivery.